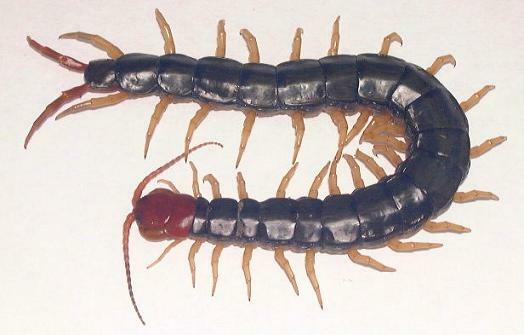 The dry polypites of Scolopendra subspinipes mutilans L. Koch of family Centipede. Jiangsu, Zhejiang and Hubei provinces and so on in China. Captured in spring and autumn. Slight smell of fish, special terrible smell, pungent and slightly salt taste. Dried, long body, red head, reddish brown legs, blackish green body, intact and flat abdomen. Inserted bamboo piece into the head and tail of Wu Gong to make the polypides keeping straight, then dried; unprocessed or baked, or stir-baked with liquid then in powder. Extinguish wind and stop spasm, counteract toxic pathogen and dissipate nodulation, unblock collateral and alleviate pain. Being pungent and warm in property and with the actions of moving, communicating interior and exterior, it can extinguish endogenous wind and stop spasm. The strength of its actions is stronger than Quan Xie’s. It is mutually reinforced by Quan Xie to treat spasm and convulsions caused by various reasons, such as in formula Zhi Jing San. It is also combined with proper herbs to treat chronic or acute convulsions and epilepsy and so on. It has actions of treating toxic diseases with toxicity, dissipating nodulation and relieving swelling. For malign sores, abscess, scrofula, goiter, it is often combined with tea leaves to ground into powder for external application, or combined with herbs to reinforce actions of heat-clearing and phlegm-resolving and hardness-softening and nodulation-dissipating. For instance, it is combined with Xuan Shen and Zhe Bei Mu, etc. It is combined with toxicity-relieving and abscess-curing herbs. For instance, it is combined with Xiong Huang and Zhu Dan Zhi to make paste for external application in Bu Er San. It is good at dispelling wind and unblocking collateral to alleviate pain just like Quan Xie. For stubborn wind-damp arthralgia with severe pain, it is often combined with wind-damp-dispelling herbs and collateral-unblocking herbs. For instance, it is combined with Fang Feng, Du Huo and Wei Ling Xian, etc. For stubborn headache or migraine, it is often combined with wind-dispelling and pain-stopping herbs. For instance, it is combined with Tian Ma, Chuan Xiong and Bai Zhi and so on. Decoct 1~3g. Take powder 0.6~1g. Take proper dose for external application. It is toxic, so it should not be used in large dose. It is contraindicated for pregnant women.